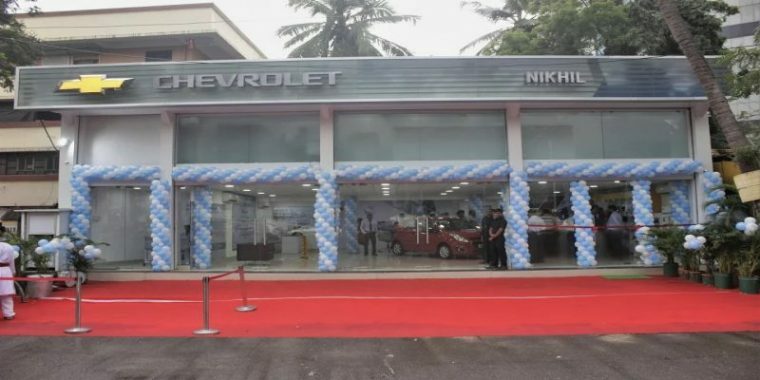 Today General Motors India inaugurated its newest Chevrolet dealership in Mumbai, “Nikhil Chevrolet.” The bowtie brand now has 7 showrooms and 9 workshops in Mumbai, and 23 showrooms and 26 workshops in the state of Maharashtra. The new showroom is located at Malad Link Road, Mumbai, and will be supported by a two workshops at Goregaon and Kurla staffed by a team of highly trained engineers. In India, Chevy currently sells seven models—the Beat, Cruze, Enjoy, Sail, Sail Hatchback, Trailblazer, and Tavera—with plans to launch at least five more models within the next two years. Chevy customers across India can take advantage of the Chevrolet Complete Care program, which includes the industry-first Chevrolet Promise: guaranteed low cost of maintenance and three years of 24/7 Roadside Assistance, and extended vehicle warranty at a nominal cost for vehicles five years old or younger. GM India is also reaching out to customers digitally, with the Chevrolet Service Estimator Online tool on the Chevrolet India website, and the MyChevroletIndia mobile app, which helps drivers find the nearest authorized Chevy service station.